VEKArail® can be customized with accessories that will complete the look of your VEKA railing system. 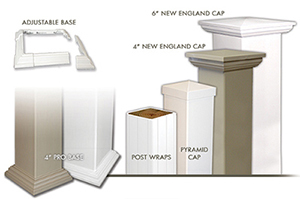 Choose the simple design of our pyramid cap or the simulated routed wood look of our Classic New England style caps. VEKA posts are universally sized so there is an array of lighted and decorative caps to enhance your railing even further.